Lynn Cauley grew up in a household that bled black and gold during football season, so as an adult, there never was a question she wouldn’t carry on the Steelers tradition. “I came to all the games when I was a kid,” recalls Mrs. Cauley, of Park Place, whose sportswriter father, Carl Hughes, covered the Steelers for The Pittsburgh Press before becoming assistant manager of Kennywood Park in 1956. But even good friends are a little surprised at just how far she and husband, Jim, go in the days and hours leading up to a home game at Heinz Field. A rousing tailgate isn’t just a tradition for the East End couple. It’s practically a religion, and not just because most of their parking lot-parties unfold early on Sunday morning, when the faithful of another kind are settling into pews at church. Long before the gates to Gold A swing open at 8 a.m., the Cauleys are preparing for the pre-game celebration, which for the last few years has drawn more than 100 friends, family and business associates. Up at 4:45 a.m. to put food in the oven, the couple is on the road with a packed car by 7:15. To dawdle, says Mrs. Cauley, would be a rookie mistake. In this town, they’ve got plenty of equally crazy company. 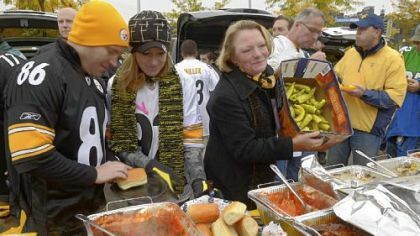 Pittsburgh prides itself on being the Tailgate Capital of the World. Rain or shine, blistering heat or blustering snow, each of the stadium’s 22 neighboring lots is packed during home games with thousands of fans. They bring with them an amazing display of pre-game munchies. Even before many of us have had our morning coffee, the intoxicating aroma of kielbasa, pierogies, wings and burgers on the hibachi fills the air. More than a few fans lay out elaborate tablecloth buffets, complete with fancy cocktails and gourmet eats. On one recent Sunday, Rocco Ferrante, a Mount Washington native who now lives in Princeton, N.J., could be found deep-frying, right on the pavement, not just a turkey, but also a duck. And don’t forget dessert. Brownies, cakes, pies, bowls of candy and assorted cookies. She admits throwing such a big party takes lots of preparation. Wednesday finds her shopping for paper products. On Thursday, the marathon cooking sessions begin, starting with sauce that will serve as the base for her husband’s “signature” hot sausage sandwiches. They’ll make enough to fill six trays. “The secret is to grill it,” says Mr. Cauley, who when he isn’t cooking is a sales executive at Ceiling Systems Distributors, a construction supply company. His wife’s specialty, meanwhile, is another Pittsburgh classic: sweet banana peppers stuffed with a spicy mixture of sausage, cheese and bread crumbs, and then baked in red sauce. “They’re homegrown,” she says of the long yellow peppers, proudly holding up a box of the veggies she brought to a recent tailgate for all to see. Before last Sunday’s game against Washington, the menu — determined each week by the weather, and emailed to invited guests along with parking directions — also included fried chicken, honey-baked ham, meatball hoagies, two kinds of potatoes and several desserts. Helping to wash it down were pineapple vodka martinis. There also was plenty of variety at Louis Lipps’ tailgate along Art Rooney Avenue. Once a year, aided by friends, the former Steelers wide receiver cooks up a storm to raise money for the Flight 93 Memorial Fund. It’s a Southern delight, offering invited guests everything from fried catfish to seafood etouffe to Cajun beef stew to gumbo and jambalaya . . . or as he puts it, “something you can’t get up here. Rob Castille’s tailgate for about 20 friends was a bit more traditional, serving up real-deal pierogies sauteed in butter and onions, big bowls of Buffalo chicken dip and hot wings. Though the Greensburg native did have one thing on the menu you might not find elsewhere: drunken gummy bears. This recipe can be prepared ahead of time, and kept in the freezer. Cut off top of the banana pepper. Slice one side of pepper lengthways. Clean out seeds, rinse pepper, turn upside down on paper towel to dry. Repeat with remaining peppers. In a large bowl, mix ingredients through salt and pepper. Pour Classico Sauce to cover bottom of 10-by-12 inch chafing dish pan. Gently part sliced pepper and generously fill with combined ingredients. Place pepper in chafing dish. Repeat with remaining peppers. There will be 2 layers when complete. Cover top of peppers with sauce and sprinkle with 8 ounces of Italian Five Cheese. Bake for 1 hour in a preheated 350-degree oven. Grill sausage for 10 minutes on each side under medium flame/temperature. Remove from grill pad, then dry with paper towel to remove excess grease. Place in 2 chafing dish-size aluminum pans. Add 1 jar of each Classico sauce into the pans with the hot sausage. Cut green peppers into 21/2-inch long strips (3/4 inch wide). Cut banana peppers into 1-inch circles down the length of the pepper. Cut the onions in half and then into 1-inch sections. Combine the peppers and onions in a large skillet over medium heat. Add the 1 stick of butter and cook for 12 minutes. Season to taste with seasoned salt. Drain excess butter from skillet and evenly divide and spread the onions and peppers onto the 2 pans of hot sausage. Cover and bake the hot sausage pans in a 325-degree oven for 1 hour. Remove the cover and put one package of mushrooms in each pan. Cover again and place the hot sausage pans back into the oven for an additional 25 minutes at 275 degrees. When sausage is done baking, slice rolls, and enjoy a signature hot sausage sandwich — it’s the best sausage sandwich in Pittsburgh.